return to Florida in the fall. 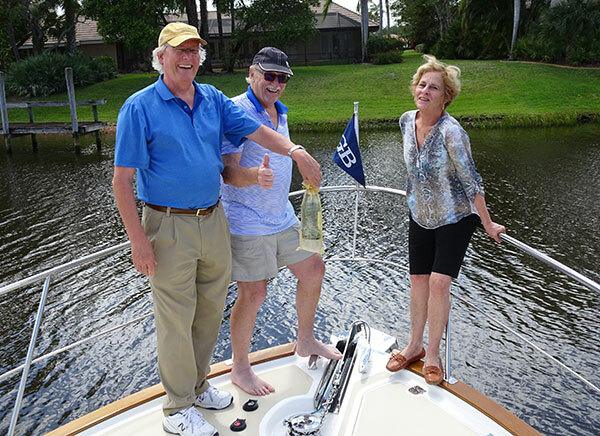 Jerome "Buzz" and Marcia Howe are extremely excited during the christening of their 2005 Grand Banks 43 Eastbay HX, "KENZIE" on June 17 at the HMY docks in Harbour Towne Marina, Dania, FL. The Howe's plan to cruise South Florida waters and the Bahamas. Owners Norman and Jody Powell christen their 2011 Grand Banks 53 Aleutian RP, THE RIGHT COMBO, with their son, Casey Powell and beloved Salty Dog. The christening took place on February 2, at the HMY docks in Harbour Towne Marina, Dania, FL. Steve Fithian, Cindy and Michael Ostrow at the christening of LUCKY STAR III, a new Grand Banks 54 Heritage EU.